Once a hunt for your scalp has been started, some bloodhound JW elders will rarely let up until they feel the congregation has been cleansed. This story is quite remarkable and no doubt many will appreciate it being told. It is telling for several reasons; it highlights the fact that the Watchtower Organization can expel and marginalize anyone for literally anything if they are crossed. They did that to Ray Franz back in the early 1980s and they recently have done it to these fine folks. 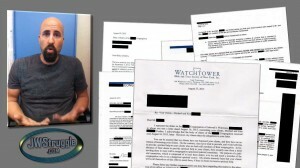 There are six pieces of documentation1 in the account and it is in some ways “a complicated mess”, but it really boils down to a couple of active Witnesses informing on someone to the elders. 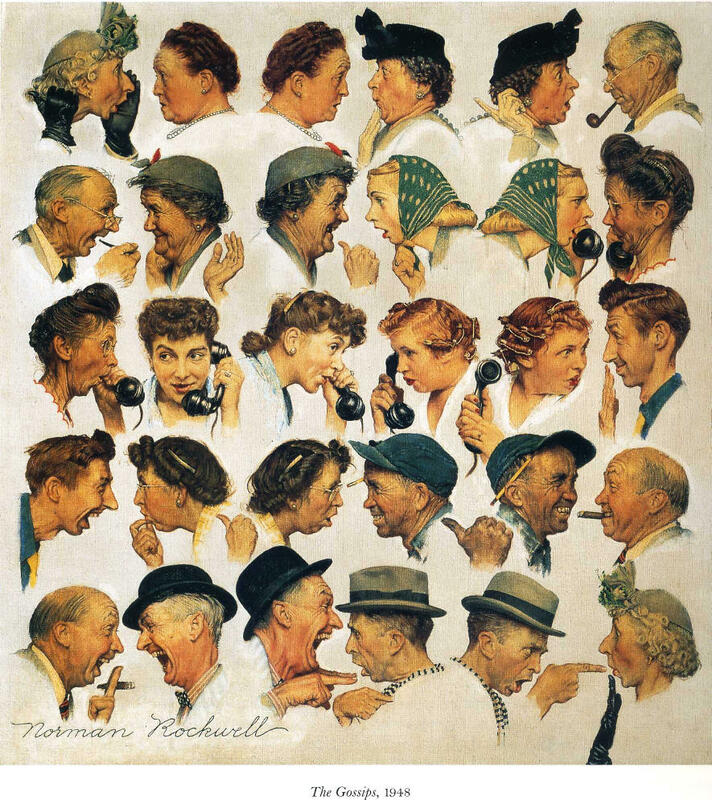 Once the accusations are made, the Kingdom Hall gossip-mill and then even the Watchtower machinery begins to turn. If you do not play ball then they can simply call three strikes and you will be put out. The documentation is both chilling and informative as to how these matters are carried out, in-line with Watchtower policy and elder prerogative. Admittedly, not all elders behave this way, but unfortunately many do. The following letters include correspondence from a local elder committee, the chairman and chief inquisitor being an elder named Peter who orders them to a judicial committee on the charge of apostasy via registered letter. 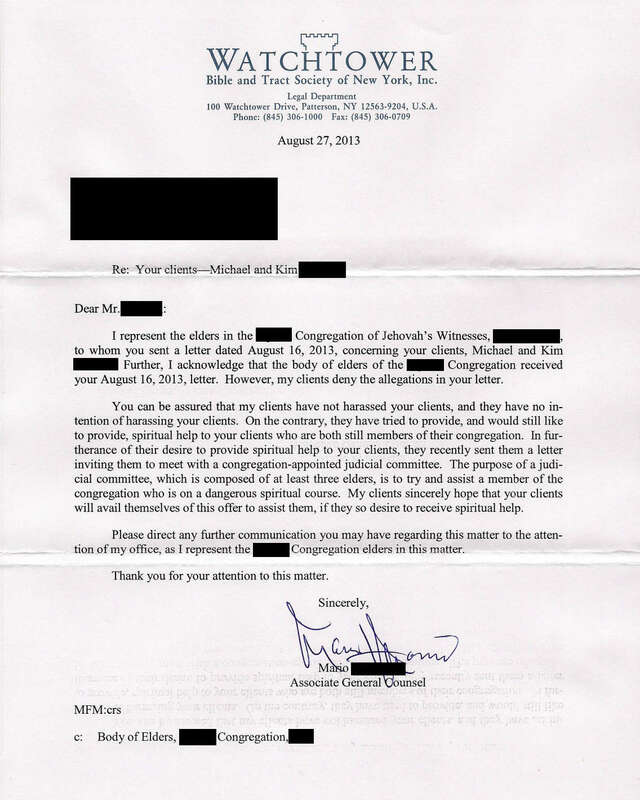 The accused couple Mike and Kim wrote a written response, their lawyer writes a “cease and desist” letter, and a Patterson New York Watchtower attorney named Mario reinforces the myth that the elders only “want to help” the spiritually erring couple from their allegedly wayward course, while making the veiled threat that they better “take advantage” of this unwelcome help. So we have a married couple, Mike and Kim, that were members of a local Jehovah’s Witness congregation for many years. Somewhere along the line they did research, they learned TTATT, and they gradually stopped going to meetings and associating with the Witnesses. Their conscience now tells them that they can serve God without the Watchtower organization and their self-appointed Governing Body. They don’t need man-made creeds, they are not going after their former associates at the Kingdom Hall, and they just want to be left alone. Well Mike is over at his mother’s around early 2013, and she and him get into an argument over the treatment of his daughter since she has stopped attending meetings at that time. Nothing “apostate” was shared or shown, just expressions that perhaps she could be more open-minded when it came to the topic of God. Soon thereafter he shows his brother what he feels could be a subliminal image embedded in a Watchtower Society photo, taken from the Watchtower Magazine dated 9/15/2005, page 25. Later the brother told their mother about it and they talked among themselves about their misgivings. How gossiping works in the congregations. Some time later the mother (and the brother perhaps) tells the elders and possibly others in the congregation that her son has been “poisoned by the apostates” and has left The Organization. Her elders call the elders that attend in the congregation where Mike and Kim used to attend and they assign two elders to investigate the matter. Now this is where it gets interesting. So this elder named Richard starts calling, and wants to have a conference call with this couple along with another elder named Robert. They were asked to stop calling and not to come over. Mike and Kim did not want to talk with these men that is their right. Then on May 13, 2013 The elder Richard shows up unannounced at their home with an elder named John. They are asked nicely to please leave, that Mike and Kim just want to be left alone. Then on August 7, 2013 an elder named Pete comes with another elder that they didn’t know the name of. They begin to pressure the wife, Kim, and she has them into her home briefly and again reiterates that Mike doesn’t want to meet with them and she didn’t either. Mike and Kim promptly contacted their lawyer. 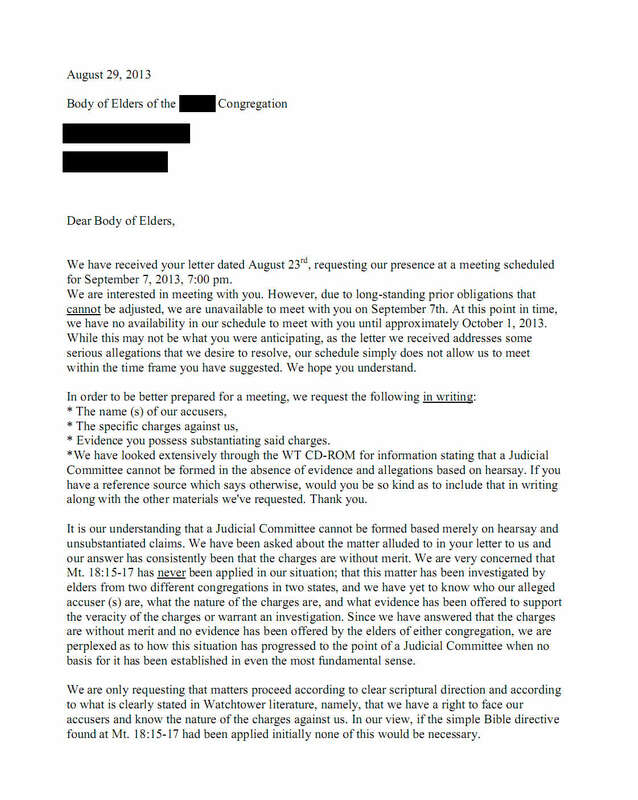 Two days later, on August 16, their lawyer sent a letter to the body of elders alerting them to the fact that what they are doing is considered harassment under the law in their state. Their client will not sit idly by and do nothing if they continue this course. They are then encouraged to meet with the elders on September 7, 2013, about two weeks from the date of the letter. 1. 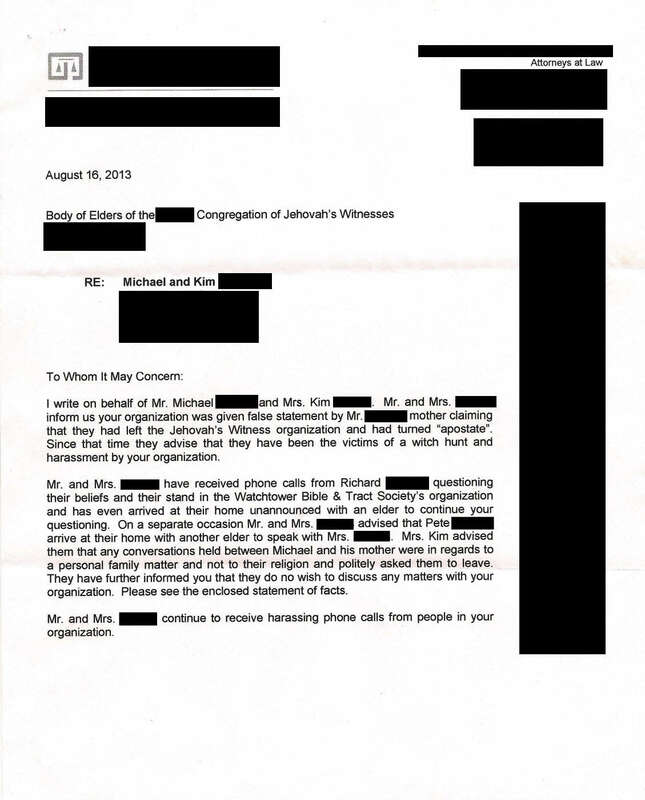 That this WT lawyer represents these elders that have been harassing Mike and Kim. The veiled threat of course is there, and his implication is that they are rejecting something good and offered in sincerity. If they refuse this “spiritual help” then they will be dealt with is the veiled threat of the letter. Two days later, on August 29, 2013 Mike and Kim write back and explain that they cannot make it on the requested date of September 7th. 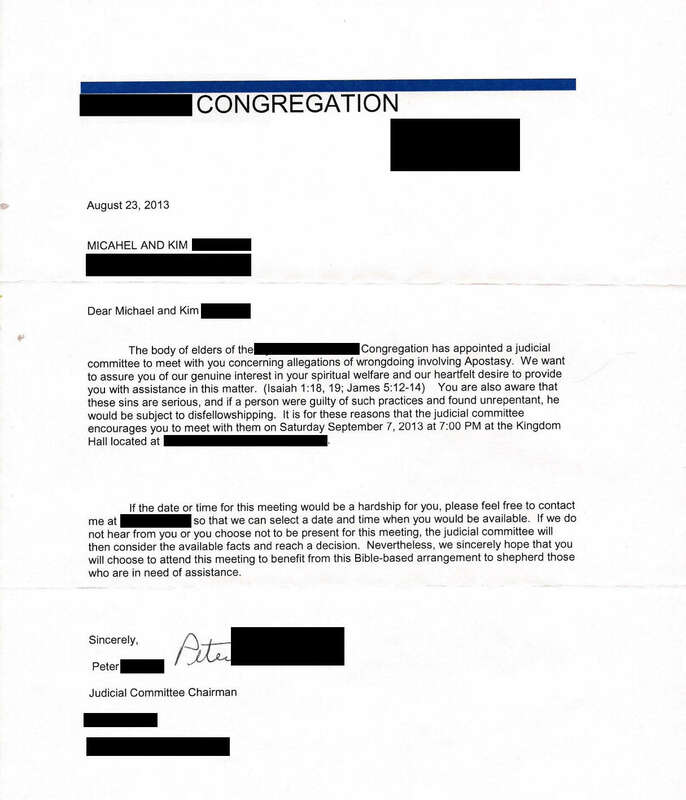 The letter is closed by informing them that if they do not attend then they will “consider the available facts and reach a decision.” Up to this time these so-called facts have not been disclosed but only can be the testimony of Mike’s mother based on the conversation previously mentioned. It is signed by Elder Pete, and his title is given as Chairman. 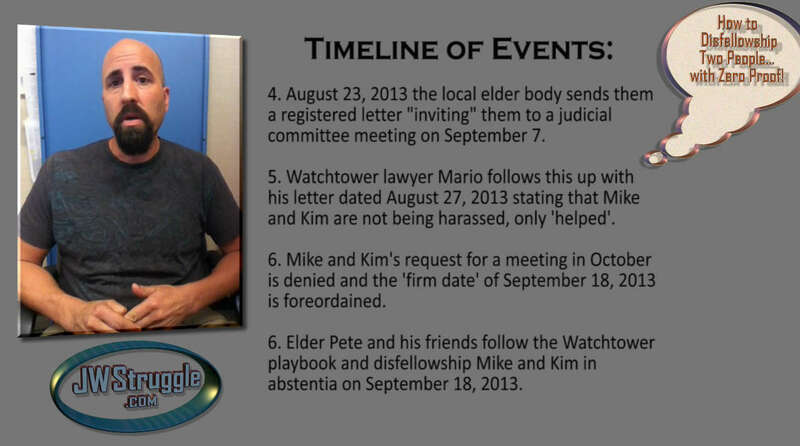 Mike and Kim receive this information just 6 days prior to the appointed time of this mock-trial with the elders. They declined to attend. 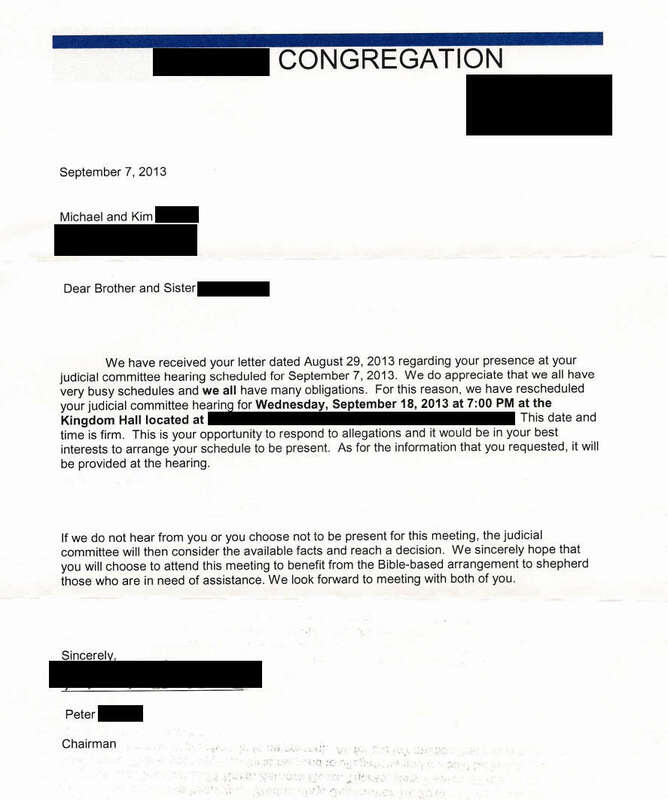 Less than one week later, on September 18, 2013 these elders decided to disfellowship Mike and Kim without ever having even told them what it is that they supposedly did or hearing their testimony. 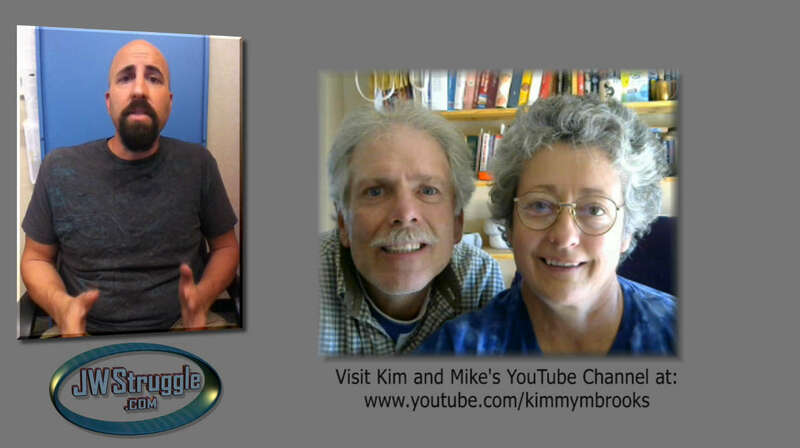 The good news is of course that Mike and Kim are now completely free of Watchtower judgment and ecclesiastical control. They can now pursue freedom any way that their conscience’s dictate without being told what to think or believe by Watchtower Organization elders and lawyers. 46 Comments on How to Disfellowship Two People… With ZERO Proof! 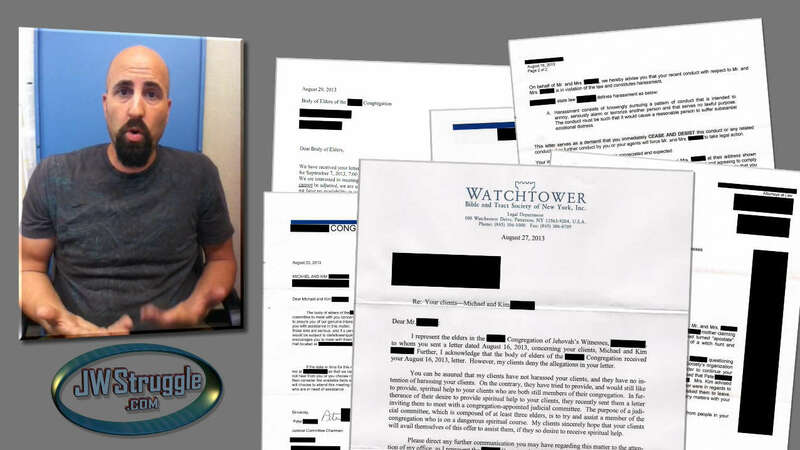 The Harassment is so akin Scientology, the Church of Scientology might sue the Watchtower for copyright volition. Brother will deliver brother to death, we were warned, sign of the times. Sad to see it. Wow! Craziness!! Straight out of the pages of “1984”. It seems the elders dealing with me broke all the rules too. An elder visited me once with his wife, then another time on his own, to “assist” me if I had “emotional problems”. Obviously if you question the GB, you have emotional problems! When he came on his own he said “You’re allowed to have different views”. I think he actually believes that because it soon became apparent that HE has different views himself. I shared some of my concerns, particularly about doctrine regarding “one channel”. He virtually BEGGED me to allow him to return with another brother. I believe he really did think he could “help” me. I said, “What’s the point?”, but at his insistence I caved. He returned with an elder and we had a very enjoyable discussion, with lots of laughing! I contacted him the next day because I was confused. Why could I discuss my views with them, and not anyone in the congregation, without getting the phobic apostate response?. He said I could discuss things with them because they were there to assist me. These two brothers visited me a second time and the result was that they put two choices only before me: “Resign” or “be kicked out of the club”. I opted for the second. These brothers who also served on my judicial committee were therefore witnesses and judges, after ENCOURAGING me to speak up and making me feel like it was ok. I don’t think they personally wanted to disfellowship me, but I forced their hand – made them follow the “rules”- to expose the harsh injustices of the GB. Years ago I remember a WT about Jehovah’s reasonableness. It urged Christian shepherds to “err on the side of mercy”. This clearly did not happen in Mike and Kim’s case, nor mine. These men should remember that they will be measured the way they are measuring. Wouldn’t like to be in their shoes! I had a lot of elders walking on eggshells around me a few years ago. I was ticked and didn’t bother hiding it from anyone. I had one severe advantage over them that most publishers normally wouldn’t though. –One of them owed me an awful lot of money. I’m pretty sure I’d be disfellowshipped by now if the threat of a letter to the Org. from me in regards to these debts wasn’t hanging over them. Eventually I sent that letter anyway saying that legal action was forthcoming. One of them (that didn’t owe me money) ended up losing his position and leaving the congregation. I knew a guy from New York who kept tabs on the local police to ensure his safety from them. Maybe that’s the best route with elders too. Get some dirt on them and keep it handy. I left of my own accord sent a letter in telling them to leave me alone and to be taken of there list of calls should they want to later on,anyways they did what I asked they have only called once in like 3 years or so, so iv been ok,they did bug me quite a bit thoe when I stopped going,I think the kingdom hall I went to May not be as bad as I thought,they ignore me mostly if I see them in the street exept one a few months back I saw in the mall and she started to talk to me I couldn’t beleive it and she not daft she talked with me for ages, it sad REALY when I hear these story’s why does it have to be like this why can’t they just be loving and say ok you want to leave us and just let people leave with out causing a big stink about it, they make people feel like criminals its sad. It’s nice to hear from you Serein I hope that you are doing well! I’m glad you are free Sis it is a big and bold step to do what you did but it is always for the best when we opt for freedom and are able to make the break from slavery to men. The GBs sins mass clear up to heaven! Having completed a thesis on ethical and human rights violations in this organisation it becomes clear that all such people become victims of a system that reveals its creators as having ultimately zero love for those they profess are brothers and sisters! Imagine that merely if someone simply dislikes you and has powerful relatives how easily a whole life’s spiritual work can come crashing down. Senator Joseph McCarthy, Stalin, and the Catholic Inquisition would be proud of what can be accomplished in the West even under the American First Amendment (which also guarantees free speech, ironically). Anyone who “deliberately spreading teachings contrary to Bible truth as taught by JWs” is guilty of apostasy. Only that JWs truth never equal Bible truth. But if someone only quit meetings or an ACTIVE association, there is no proofs to start JC in my opinion [former elder for 5 years]. To kick out any persona non grata they will even not to have scruples about ‘going beyond what is written’ in their own Elders’ Manual… They use fear, guilt and harassment. Actually, ElearElda, where a person stands accused and the determined Judicial committee do not have the two required witnesses they can ‘oblige’ the accused to reveal their thoughts, which if not ‘in line with the current teachings’ of the Governing Body, can lead to being disfellowshipped as an apostate. This is a violation of a citizen of the right not to self-incriminate. I picked 20 other ethical and human rights violations in the Scottish Matthew Barrie judicial case. The whole JC procedure is total bull. I really think some elders “get off on it.” it gives them a feeling of power. I also think that elders get pumped up and excited when they are involved in a JC. Especially when it involves fornication. They love to hear all the details. I actually had a friend years ago who was an elder and he would tell me all the details of certain committee meetings involving fornication or various other cases. Grant it, no names were mentioned, but still it was eye opening that an elder would discuss it. He did tell me that the worst JC are always “apostasy” ones because he said that apostates are very slick and smart and it’s obvious Satan is using them. Haaaaa! What a joke! Darn tootin’ we’re smart…because we know TTATT and know more about the Society and it’s history than most active JWs!!!!! Yes, it’s POWER and the feeling of Self Importance. That’s why some of them are bragging being once a member of a JC. Imagine being a “Judge”… Some of them are just ordinary people, with no special status outside the organization. Inside the congregation, they are somebody, and when given special privileges in the congregation, stand on the platform wearing neckties, congratulated after the speech, given transportation allowances,and treated like a very special person when invited to give a speech in other congregation, well respected and consulted when problems arises, followed their directions like a master, surely these things will go into their head. Some really want to serve and I admire them for being so.Some members want to become an elder for these selfish reasons. The feeling of control, power and importance is the same one that emanates from Brooklyn, yes, from their father the GB. Yes, 2 janitors and a plumber in 50 dollar suits rule over life and death matters! This is so sad. My heart goes out to these people. I was raised in this religious cult and I have to be honest, I thank God all the time that I never baptized into that Organization. Growing up I was always very perceptive and I was always questioning everything. Albeit to myself but I just always had a feeling things were not what they seemed. I always remember feeling so horrible for those who would be disfellowshipped and how they would walk into the KH and just bow their heads down and no one would so much as look at them. As though they were not even there. I just never understood why it was necessary to be so cruel to another person like that. Anyway I hope Mike and Kim are doing ok and that I hope they know they are in my thoughts and prayers. Great article. I still find it difficult to believe how heartless and pitbull-like they were! Makes me think about what may happen to me. I have faded completely for a few months and the elders in my cong thought I was still living at home, my father is retiring, my mother is on disability, my little brother who has also faded pays the bills, and they want to question my dad for having us “under his roof” since we are doing bad “spiritually”. I never got a phone call or a visit from the elders or the friends to just ask how I was doing when I was getting treatment for cancer, some “friends”. Now they took advantage of my dad’s hearing disability and he accidentaly told them I was in contact with DF’ed/Ex-JW’s/Apostates who have influenced in me to stop attending the meetings…long before I discovered TTATT I had left because of the hipocrisy and this time it all started with realizing how there is so much hipocrisy, favoritism, double standards and the list goes on. Why can’t they just let people leave and live thier lives in peace? It’s just more proof it is all a cult, a damaging cult from which we are all still healing from. I pray that all of us find peace. Hi CM. Yes, congregation, particularly elders, have few exceptions when it comes to showing the agape Christian love that is so eloquently boasted by WT propaganda. This was also the experience told in the Townsend judicial committee where a husband and wife had drifted after doing their own research and finding many inconsistencies with what they were being taught. The wife became seriously ill and no one had even the common decency even to phone. There is an expectation that if all is ‘well’ then this is equal to being spiritually strong. When the ‘balloon goes up,’ however, little effort is made to ‘save the wrongdoer,’ and preparation is made to neutralise what then is considered an apostate threat (perceived or actual). I think Frank is dead-on. Just wait until the ” 8 Dukes ” article hits the stands. The GB have basically given the Elders the right to invade your private life. Frank, I would love to read your thesis. What I find so sodden with hypocrisy, is that two witnesses are needed for the elders to even consider talking with someone accused of multiple accounts of child sexual abuse spanning multiple congregations…and yet this iron creed melts into mist when someone is even suspected of questioning the Image of the Wild Beast Organization…which is taken as a provocation, and insult to it’s proud authority (Rev.13:4). So much for the “mark of a true Christian” (Love), which they tout as embodied in these slandering brutes. They have become just like the Pharisees… Disgusting !! when are you going to develop a Message Board system so we do not have to visit the highly toxic Jehovah-Witness.net Boards? It’s time now, with the recent departure of long-time members on Simon’s board because he allows believers in the meta-physical to be ruffed up by angry and bitter atheist. What would you need to get things going and develop a site all religious and spiritual people can attend without being called wicked names by faithless people. Please email me and let me know how we can set things up, I would love to help you Eric. You said our emails are private, thank you for helping us Eric! Hi Cranky Carlitos…please join our forum, and your wife too when/if she’s ready! I’m sure you will find friends there! We are all spiritually minded and civil! Cranky Carlos may find some times cranky ones, to help him feel cranky in the forum. l do agreee with what sis pearl said. I haven’t noticed anyone being uncivil in the time that I have been on the forum. There have at times been strong opinions, yes, and perhaps some injured egos, but that’s all! We are only human! Just joking my dear! You were supposed to laugh. MMM maybe im a bit dry? Sorry cranky carlos. l thought your name was funny. Actually l think its really funny. Are you really cranky? Your so welcome out in the forum we would love to have you come over. Sorry sis Ruth! Glad you cleared that up…just didn’t want to put any off visiting us in the forum! Love you! so many friends dont realize how legalistic this organization is> for those who have the inside scoop, they may fair a lot better than others who dont really understand the inner legalistic protocol, even a letter from an attorney could not stop a disfellowshipping from taking place. i still feel strongly that this should be challenged in a court of law with regard to a serious violation of ones civil rights, how long is it going to take before someone brings a case to challenge this demonic control. this is not the right to peace and the persiut of happiness! by the way when is the organization going to be disciplined for being a charter member of the evil united nations? but yet their representatives can continue to cut the throats of good well meaning people! this is why anyone who is asked to meet should always insist on detailed facts regarding the purpose for the meeting, then if the request is refused there are grounds for bringing a case to court. and it will also tip you off as a red flag that things will not go well due to their being overly secretive which causes distrust ,wt 91 9/15 communication in the family and the congregation. Just watched a documentary on the history of Christianity. Constantine, on his “conversion” to Christianity introduced “orthodoxy’, and with that, “heresy”….for which one could be punished or executed. This was so as not to threaten his “social and political agenda”, which required unity. I wonder what the “social and political agenda” of the WTBTS is? A “New World Order” perhaps? Funny how they dropped that expression in favour of “new system” a couple of decades back. Probably because secret societies and governments have all used that expression. Here we go again on the hypocrisy of the WTBTS. Human rights are denied all the time under the ungodly ‘judicial’ system they espouse and practice. Whose reputation has it marred. The system itself discredits everyone who has a story to tell. Only ‘apostate’ sites like this carry the truth! Hi Frank, there have even been cases where two witnesses have been created if you will, to bear false witness against someone whom the club house lawyers(elders) want to DF. by the way the newest direction is that elders who serve on a judicial committee cannot act as witnesses to a case leading to a judicial committee. 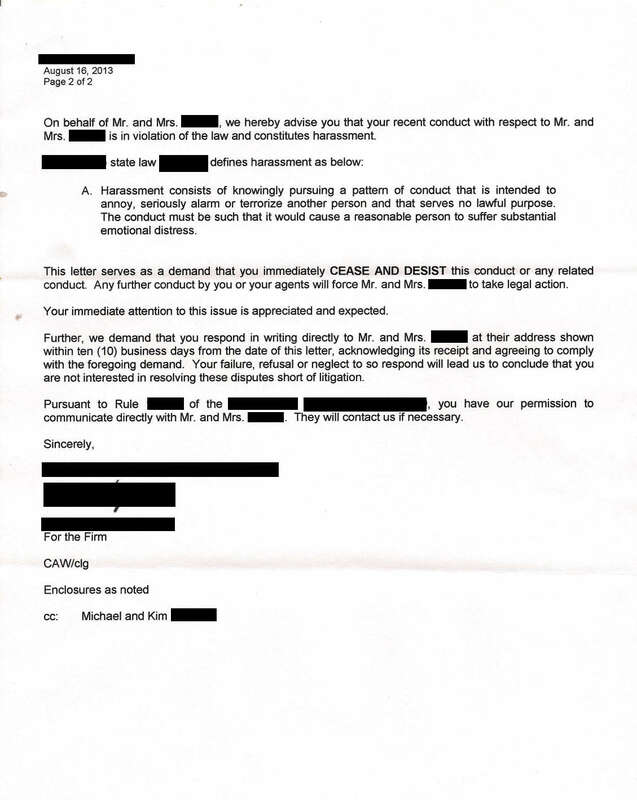 As far as a cease and desist letter from an attorney if the body of elders after receiving a letter, insist on continuing to move forward if at all possible the accused needs to follow through by commencing a civil proceeding asking the court for a judicial ORDER of compliance, from a real judge, then if they proceed and go forward with a kangaroo court, they are now violating state law, and further proceedings for damages can proceed in behalf of the accused. any thoughts frank? Hi Bill. Are you saying that secular law can now apply in a religious court? If so, it certainly is a step forward, but I’m wondering how Caesar can insist on this under the First Amendment! Unless, of course, this applies outside America. Could this be to do with new American hate-speech legislation? If Caesar can impose on a defamation level, I would imagine the WTBTS not guilty of willingly providing for natural human dignity on the part of those they claim are their ‘brothers’. Rather, their hands have been legally tied. After all, no one could ever accuse the WTBTS of having humanist ethics. They are driven by Divine-command ethics. Thanks Bill. Please keep me updated on this. Frank, harassment is a state charge, if someone violates a cease and desist order for compliance from a judge, they will be prosecuted. if one of jehovahs witnesses robs a bank and it is discovered by caesar, ecclesiastical excuses will not prevail, the ones(Body of Elders or a judicial commitee will be prosecuted individually. the problem is none of our friends have ever had the nerve to try this litmus test in a court of law using this approach to get the threat of the wtbts off of thier backs, especially where no evidence or enough witnesses to a matter exist. just a side note: i read a comment somewhere on this site where someone mentioned the only way someone will see the truth is on an apostate site like this, my remark to that statement is who said this is an apostate site? jehovahs witnesses? their brain washing goes so deep that even after someone leaves the organization they still feel compelled to use terms that only the wtbts have taught them!!! this is not an apostate sight! its a site where friends are sharing information and experiences that they have knowledge of or have personally experienced. whats wrong with that i ask? people complain about their politicians all the time, does that mean they are traitors to their belief system? of course not. [This is] a site where friends are sharing information and experiences that they have knowledge of or have personally experienced. whats wrong with that i ask? Hi jj finally good to chat with you, i have been raised in the organization all my life, and always have seen much more wrong with the whole thing than all of my elder co relatives,is it just me or do they see it too but are so deeply involved they dont dare say or do anything about it? i remember years ago a pretty popular d.o. Dennis Raftopoulas told me after a matter we were handling that even he doesnt agree with everything regarding organizational procedures. i thought that was interesting one can never tell who has doubts, and at any level on the pyramid scheme. Hi Bill. Please forgive me if I missed it, but can you declare your interests in your comments above. Have you ever been a JW? Are you a ‘secret’ dissenter, or are you using irony to make a point? The full and only reason why the WTBTS acts in this religiously arrogant way about the so-called “JW justice” is because they are protected by Caesar in this, not outside technically, because only America has the First Amendment right that government not interfere with religious judiciaries. The shunning issue was taken to the Supreme Court and was thrown out, not because the government condoned the act, but because under the First Amendment, their hands are tied. They cannot make moral judgements and presume that when someone joins a religion, they understand the pitfalls. Hopefully the Candace Conti case will be different. The Appellate court could just decide patriotically that they can’t ‘interfere’ with any part of American religion, or they can view the WTBTS as an American organisation and as knowingly put this girl/woman in danger from a listed sexual predator. It could go either way, but they choose the latter, the power of the WTBTS will be made fuller than it is under this morally-ambiguous lawful phenomenon. Hi Jack. I’m confused by what you’re saying here. The First Amendment protects ALL religion in the US. Obviously it creates a certain ‘hand-off’ attitude of the governments that we look to for protection, but all of us are hoping that the Candace Conti case will loosen the grip of the indifference organisations like the WTBTS have when it comes to presumption and arrogance. It’s a way to be guilty of a crime yet innocent under the FA. Particularly when WT own Scripture “proof” for disfellowshipping isn’t even applied! I am smack dab in the middle of my own fight with WT that has now lasted 2 years!!! Can’t talk about it but let me tell you it has been horrible. Not DF’d but stopped attending meetings. C/O and Elders came to visit me and I told them EXACTLY why I stopped attending meetings and they have left me alone! What can they say their own policies are doing them in! Good advice Anthony. Another name for answering agenda based questions from elders is ‘self incrimination’. Don’t fall into the trap. Under civilised justice systems, an accused person cannot be forced to self incriminate, hence when police arrest and charge someone they must read them their rights- “You have the right to remain silent…anything you say may be used against you in a court of law” or words to that effect. It’s the prosecuting body’s job to prove their case based on the available evidence. Visits by 2 elders at your door, usually unannounced and sometimes euphemistically called ‘shepherding calls’ are actually ‘fishing expeditions’. They ‘fish’ for information to use later as evidence in a judicial hearing. Don’t give them anything- if they call, it’s usually because of unsubstantiated allegations, gossip or simply just because you are inactive. They are there because they don’t have enough (or any) evidence to invite you to a judicial hearing. Don’t hand that evidence to them on a plate. This is why studying extant JWJC transcripts will teach to unwary the nature of this unethical system. Matt Barrie (2008) was refused the right to silence. He was told in his appeal that the disfellowshipping would be upheld because he ‘refused to co-operate with the representative of Jehovah.’ The reason? He would not restate his present personal beliefs in front of the appeal committee when they asked questions (because of the bad consequences that Matthew had suffered when he had ‘spoken freely). See: The Verdict and previous paragraphs for context. Matt had no choice but to defend himself in the orignal JC as at least one elder had plotted to bring him down (Podcast 8 Showdown at the Kingdom Hall). In being as ‘cautious as serpents’ we need to be very sure that ‘golden silence’ will win the day. In the words of Martin Luther King……..
FREE AT LAST ! ! ! Yep I believe they can and do make up their own rules as they go along. Same thing happened to a dear friend who he and his wife were Gilead Grad’s, he and his wife were missionaries, he was an elder and she a pioneer. No elders meeting. No “shepherding” call. Just presto changooooo you are disfellowshipped. The rumor mill’s verdict in not only in their congregation but the entire circuit and beyond hung an “apostate” lable around his neck. A few month later he died from a heart attack. His wife has been my best friend for over 35 years. We pioneered together and I introduced them to each other. She obviously has “faded” as I, but we are still BEST FRIENDS and that will never change.